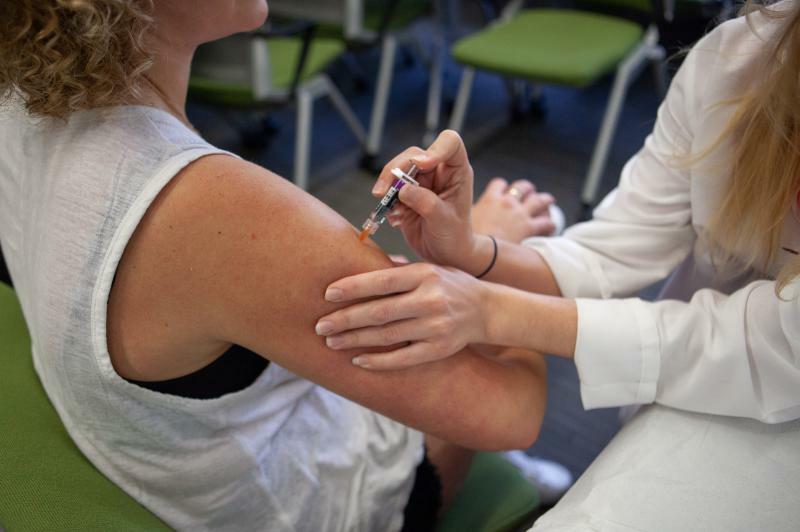 A flu shot's best beforehand, but presents little chance of risk during pregnancy. The CDC recommends the flu vaccine for everyone age six months or older, especially those with chronic medical conditions and immune systems that don’t work as well, such as infants and the elderly. And harder. Flu can progress to pneumonia more often during pregnancy, and the dehydration that can come with the virus can cause complications like premature labor. It’s best to get a flu shot before getting pregnant, but during pregnancy is also fine. Dr. Chang says complications from a flu shot during pregnancy are very rare. He also recommends the flu shot over the nasal spray vaccine. Why the flu shot’s important when pregnant: Pregnant people have much less immunity to all diseases. Because of that, all illnesses affect them more. Flu hits really hard, really fast. It hits even harder during pregnancy. Why does it hit faster and harder? Because immune systems aren’t as strong during pregnancy, complications of the flu are felt more strongly. Flu in people who aren’t pregnant can progress to pneumonia. But during pregnancy, the flu progresses to pneumonia much more often. That’s really the issue: It’s not that it’s a different virus. It’s that pregnant folks don’t fight it off as well. Other complications: Your main complications are going to be mostly respiratory, and the end product is usually pneumonia. But in the case of pneumonia, you’re talking not only the hospital, but in some severe cases, the intensive care unit – and up to death. So this is a real problem. Dehydration can cause contractions and lead to things like premature labor, too. Safety of the flu shot while pregnant: Problems from the flu vaccine shot are very rare, and certainly there are no more complications for someone who is pregnant versus someone who is not. So pregnancy should not affect whether or not someone wants to get a flu shot. Is the flu nasal spray a viable option? The nasal spray is a live, attenuated virus. That means the virus has sort of been chopped off the knees. It’s weaker than the full blown virus, but it is still alive – whereas the shot is a completely inactivated virus that has no activity left. So, from a pregnancy standpoint, you’d actually prefer the shot. Think this record-breaking heat is tough for you? Imagine what it's like for pregnant moms like Rebecca Maberry — and me. This flu season is making regular headlines, especially in North Texas, where more than 100 people have died. It doesn't compare to the flu crisis the world endured a century ago, but we can still learn from it. More than 150 people in North Texas and thousands more across the state have died from the flu this season. One person in Parker County, 13 people in Denton County, 24 in Collin County, 33 in Tarrant County and 80 in Dallas County have died from the virus. Flu season has been especially severe this year in North Texas. Earlier this month, the Walgreens flu index ranked Dallas-Fort Worth the seventh most active metropolitan area in the country, prompting area hospitals to push flu prevention more than usual. But those reminders can often miss the most vulnerable in the community – so a roving flu clinic in Fort Worth is closing the gap.